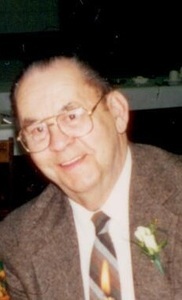 Joseph was born in Red Bank Township, Clarion County, he was the son of the late Daniel & Priscilla Cummins Reinsel. Joseph married the former Sara Davis and had 8 children. Janet, Joseph, J. Edward, ,Robert (Rube), John, Daniel, Margaret and Patricia. He was actively involved in the St. Joseph Church, the Holy Name Society, the Knights of Columbus, and the Elks and Eagles Lodges in Oil City. He died December 24, 1965. Joseph was born on Aug. 24, 1919 in Farrell, PA.
Joseph attended St. Joseph High School and excelled in sports and was the recipient of the first four- striped sweater given by the school. He was a graduate of the Pittsburgh Institute of Mortuary Science. Shortly after Pearl Harbor, he enlisted in the United States Army Air Corp., where he served in the 500th Bomb Group, serving in England, North Africa and Saipan. Returning home from the war, he worked with his father until his fathers death and then became owner of the business until he sold the business to his son in 1984. Joseph married the former Geraldine Fesenmyer and they had 5 children, Joseph ,David Daniel, Kevin and a daughter Catherine. Mr. Reinsel was a member of the Venango-Clarion Funeral DirectorsAssoc., Pennsylvania Funeral Directors Assoc. and the National Funeral Directors Assoc. Joseph Sr. was an active member of St. Joseph Church, the Holy Name Society, and had belonged to the Knights of Columbus,the Fourth Degree Assembly, VFW, American legion, Elks, Eagles and the Moose Lodge. He had also served on the Oil City Redevelopment Authority and enjoyed playing Santa for the children of Polk Center. Joseph died on June 20, 1999. Joseph was born on April 30, 1950, son of Joseph and Geraldine. He graduated in 1968 from Venango Christian High School. He was a 1972 graduate of Edinboro University and was a graduate of the Pittsburgh Institute of Mortuary Science. He was a substitute teacher before joining his fathers business. Joseph bought the business in 1984 from his father and sold the business in 2013 to his son Michael J. Reinsel. Joseph married the former Suzann Stoudt and they had five children, Joseph, Michael. Timothy, Stephen and Andrew. 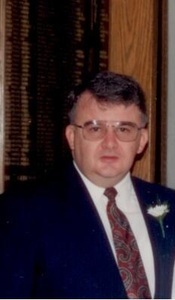 Joseph was a member of the Venango Funeral Directors Assoc., the Pennsylvania Funeral Directors Assoc. and had belonged to the National Funeral Directors Assoc. Active in his community, Joseph had belonged to the Oil City Jaycees, A former board member of the Oil City Chamber of Commerce-Venango Chamber, former board member of the Oil City Y.M.C.A, former board member of the Visiting Nurses Association and currently serves on the board of the Venango County Blind Association. Joseph had previously served as Scoutmaster of Troop 14 and had ran the Meals on Wheels Program. He is also a corporate board member of UPMC-Northwest. Joseph is an active member of St. Joseph Church and a member of the Oil City Knights of Columbus and the Fourth Degree Assembly. Michael was born on April 27, 1977, son of Joseph and Suzann Reinsel. Michael is a 1995 graduate of Oil City High School, and a 1999 graduate of Edinboro University and a 2000 graduate of the Pittsburgh Institute of Mortuary Science. Michael had served as treasurer of the Theta Chi Fraternity while at Edinboro University. He married the former Pamela L. Gammello and has two sons Carson and Rylan. Michael is a member of St. Joseph Church, the Knights of Columbus, the Fourth Degree Assembly, the Pulaski Club and a member of the Eagles Lodge. He is a member of the Venango -Clarion-Elk County Funeral Directors Assoc. and the Pennsylvania Funeral Directors Assoc. Michael serves as the Treasurer of the Oil City Columbian Home Building Assoc. and is a Past Grand Knight of Council 385 in Oil City and belongs to the Wednesday night duckpin bowling league. Michael is currently the owner of the business. Andrew was born on Oct. 24, 1988, son of Joseph & Suzann Reinsel. Andrew is a graduate of Oil City High School , Slippery Rock University and the Pittsburgh Institute of Mortuary Science. He is married to the former Miranda Harrelson. Together, they have a son named Lexin. Andrew is a member of the Oil City Knight of Columbus. Andrew is a PIAA official for Basketball and Football.